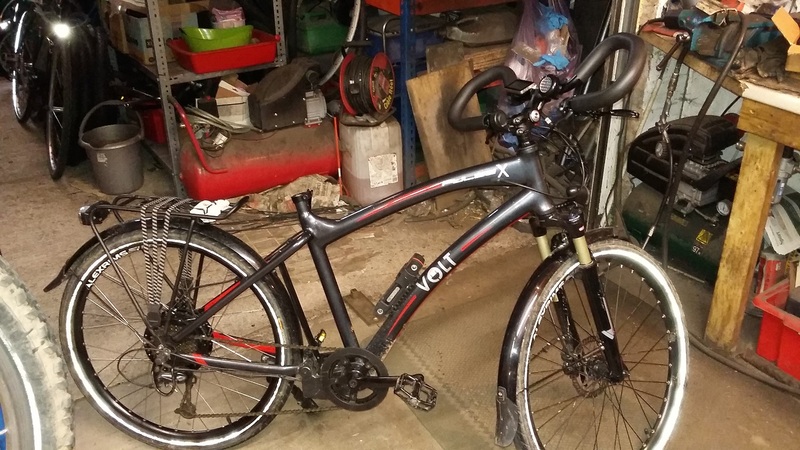 By April this year (2017) he had managed to clock up around 2000 miles on the bike but had unfortunately had suffered a couple of broken spokes in the rear wheel. 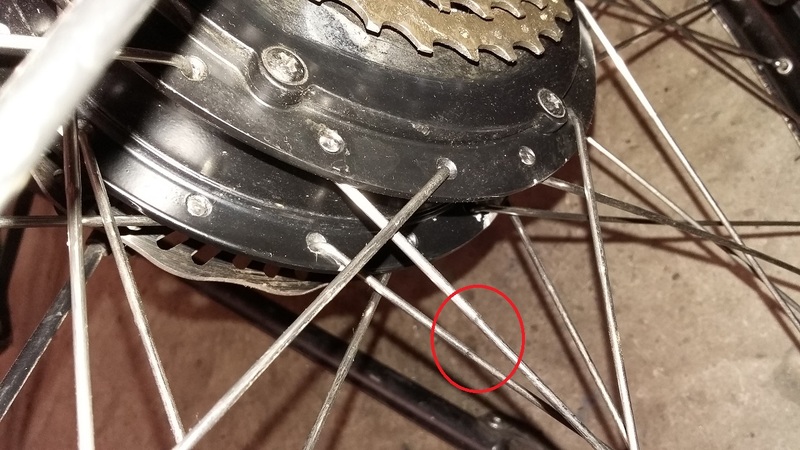 I called VOLT to see if this would be covered under the guarantee, and they very kindly sent a complete set of new stainless steel butted spokes out to rebuild the wheel. These spokes are thicker at the hub end (where the previous ones had failed). The bike was dropped off with us once more for the rear wheel rebuild (and also mend a puncture while it was off!). He decided to leave it with us for a while to get some other things done too, as he still had his old VOLT Metro that he could manage with temporarily. The customer requested to have the handlebars changed for a set of ‘butterfly bars’ as he felt that this would give him a much better variety of hand positions, and also asked for some ‘goop’ to be added to the tubes to hopefully prevent any problems with further punctures (especially on the rear wheel which is not a 2 minute job to remove). The new bars were ordered (we chose Humpert bars rather than non-descript unbranded ones) along with the goop for the tyres (I used the Slime Pro which is suitable for both tubes and tubeless tyres). Wheel rebuild was fairly straightforward, using a 2 cross pattern as the hub motor is quite a large diameter so the spokes were relatively short (240mm) compared to a standard 26” wheel. Once tensioned and trued it was as good as new. Next step was to work out how all of the control bits and pieces were going to fit on to the butterfly bars, as you only have a relatively short piece of straight bar on each side. By sliding the LCD control panel and the customer’s bell round on to the top curved section of the bars near the centre either side, it left just enough room on the straight bits of bar to accommodate the brake levers plus the throttle control on the left and gear changer on the right (see photo). All fitted on quite nicely, with the thick foam rubber sleeving slid on to the exposed sections of bar to provide a comfy grip. Subscribe to our Newsletter to keep up-to-date with any featured new or used bikes. If you have any articles, photographs or advertisements you would like inserted in our Newsletter please email us via the CONTACT US form.